Photo of Class 5 PHEV courtesy of PG&E. Pacific Gas & Electric will invest $100 million to purchase battery-electric vehicles and gasoline-electric hybrids over the next five years to reduce fuel costs and lower emissions, the nation's largest utility announced Oct. 15. With the move, the utility would allocate one-third of its vehicle procurement budget toward EVs and PHEVs. The company now dedicates about 15% of its fleet budget to plug-in electric technology, which far exceeds the five-year industry average of 1.7%, according to the utility. With the $100 million commitment, the utility will add more than 750 plug-in electric units to its fleet of more than 14,000 vehicles. PG&E already operates one of the largest fleets of plug-in vehicles in the nation with about 1,400 EVs and plug-in hybrids. "The electrification of our transportation system will be essential in helping California to meet its long-term goals for greenhouse gas reductions," said Tony Earley, PG&E's chairman, CEO, and president. "Converting more of our fleets to electric vehicles is a powerful way for the utility industry to take the lead and set an example." In addition to reducing the fleet's fuel use and lowering tailpipe emissions, EVs and PHEVs can also offer lower operating costs for fuel and maintenance, as well as extending a vehicle's life. PG&E has been incorporating electric power takeoff systems (ePTO) on the utility’s bucket trucks. This technology allows crews to operate on-board equipment, including the aerial device and auxiliary systems with a series of batteries, which eliminates the need to idle the trucks at worksites. 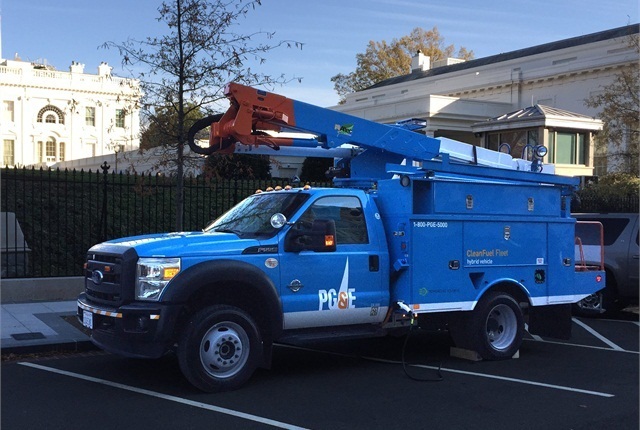 Last year, PG&E acquired the utility industry's first plug-in electric class 5 utility work trucks from Dixon-based Efficient Drivetrains Incorporated. PG&E is now working on the deployment of the utility industry's first class of bucket trucks with plug-in electric drivetrains. "We are seeing full payback on the increased initial investment in less than five years in many cases," said David Meisel, PG&E's senior director of transportation services. "In addition to the fuel savings, we’re seeing dramatically lower vehicle emissions and a better on-the-job experience for our crews."